FIFTY push-ups in a row! 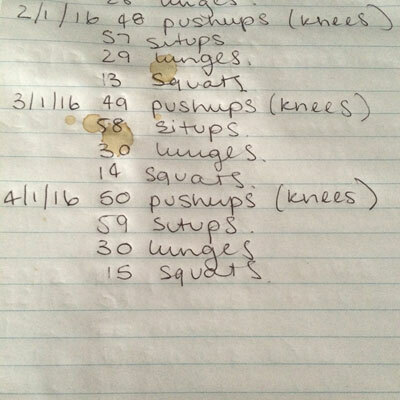 Yes, they are on my knees, but when I started this I could only do 10. THIS IS VERY EXCITING! In other athletic news, this morning I ran 5km and 3.5 hours later I’m pretty stuffed. This doesn’t bode particularly well for the 7km fun run in a month, but hey, if I have to walk some of it, then so be it. I am not going to push myself into injury by making myself run all the way. Look at me, all sensible. I’m starting to realise (which I should have done quite some time ago) that I have a tendency to go way too hard at physical activity. While this can be a really positive thing, it is often has not great outcomes, because I will take it to ridiculous extremes – such as when I was seeing the FatController and ended up broken (twice), or when I initially took the running distance too far, too soon and hurt my foot, then my knee. I just need to find that happy place of pushing – but not to ridiculous lengths – and keep the baby-steps mantra happening.